I guess the product they are advertising, Dermitage, doesn’t just reduce wrinkles—it actually transforms the Creature from the Black Lagoon into a human being! Usually “before and after photos” have the before on the left and the after on the right. So people might misinterpret this and assume the product will turn your face into a leathery relief map of the American southwest. One disappointing thing about this ad is the words that say “simulated imagery.” So you mean that Dermitage won’t actually turn my mummy into a beautiful model? Can now any two pictures be used for a before and after comparison as long as the words “simulated imagery” are included somewhere? Hat tip: Ashley Halsey who found this ad on the MSNBC website. That small arrow in the middle of the ad must be one of those “slider” things where you drag it from the left to the right to see the before/after. Which explains why here the “after” is on the left instead of the right. Wow! here is a full faced one!!! I think the “before” pictures look like a domestically abused corpse! I hate those ads! I see them all the time on MySpace and they make me naseous! 1.) 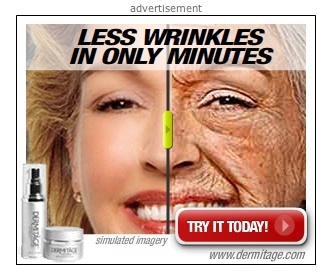 it should be “fewer” wrinkles, not “less”….very suspect grammar there. I’d really like to kick the marketing manager in the earhole for that one. 2.) I am going to assume that if you rub that puke on your face, it will also change your hair from broom stiff grey to flowing highlighted blonde. Seriously, I’d like 5 minutes alone with some jerkhole from that company just so I could beat his head into pudding.